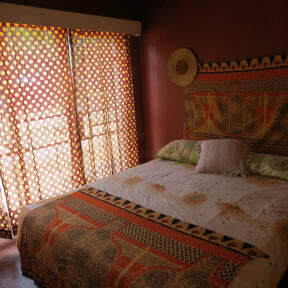 Mambo Backpackers is a place to relax and enjoy your stay when you in Victoria Falls. Offering the best comfortable beds and service. We help you book for all the activities and give you the best local tips. We offer a full equipped self catering kitchen and serve free breakfast. We have a lounge were you can relax and watch the latest films. Our location is ideal for activities and enjoying the night life. Mambo Backpackers is located 5 minuets from the heart of the city and 15 min to the Victoria Falls park. We are surrounded by restaurants and curio stores. It is in a safe neighbourhood and also saves you money for taxis. We offer private rooms, camping and dorms. With high speed free Wifi, clean towels some rooms with air con and clean linen. We make you feel at home. 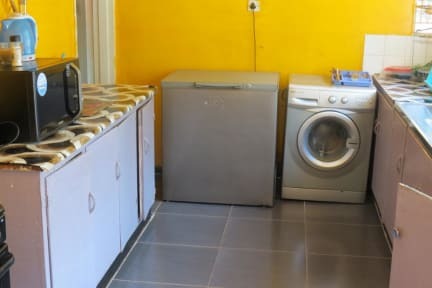 Kein klassisches Hostel, sondern mehr ein Homestay. Alles in allem aber wirklich toll und die Besitzer sind unglaublich herzlich. Wir haben uns sehr wohl gefühlt. Auch nachts kann man ohne Bedenken zu den Restaurants laufen. Gerne wieder. Nice and calm place at the Vic Falls. Everything you need is in walking distance.